Salem was declining as a center for overseas trade by 1870 when this lighthouse was built at the end of Derby Wharf, but coastal trade and the fishing industry were still going strong and Salem was considered an important harbor of refuge for vessels passing along the coast. The half-mile wharf dates back to 1762 and reached its present length by 1806; it's now part of the Salem Maritime National Historical Site. Author Nathaniel Hawthorne worked as a clerk for a time in the Customs House across the street from the wharf. For years, the twin lights at Baker's Island -- about three miles east of the entrance to Salem Harbor -- had sufficed to guide vessels into port, but the Lighthouse Board announced in 1869 that "three small lights" were required to "complete the lighting of this harbor." The square brick lighthouse, originally painted red, was built for $3,000. The tower is 14 feet tall to the lantern level, and each face of the tower is 12 feet across. A fifth-order Fresnel lens exhibited a fixed red light from 25 feet above mean high water. 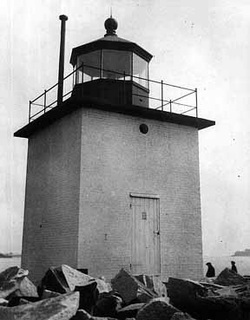 The light on the wharf was first lighted on January 17, 1871, replacing an older simple light that had been exhibited at the end of the wharf. Because of its proximity to the city, Derby Wharf Light always had a caretaker rather than a resident keeper. There were only six caretakers in the lighthouse's history, the longest stint of service being John Lynch's 20 years beginning in 1885. The caretaker's salary in 1905 was $450 yearly. The last caretaker before the automation of the light was William M. Osgood, who walked to the lighthouse each morning and evening. During the disastrous Salem fire of 1914, Osgood was occupied with saving his own home on Summer Street. His wife took the keys and lit the lighthouse for the evening, and it was reported that she was barely able to escape the wharf before the flames swept in. In 1906, a fourth-order lens replaced the original lens. In 1910, a sixth-order lens was installed. The light was converted to automatic operation, using acetylene gas, in October 1917. The light was deactivated in 1977, and ownership went to the National Park Service in 1979. In 1983, the Friends of Salem Maritime had the lighthouse restored and relighted as a private aid to navigation with a solar-powered optic, flashing red every six seconds. The National Park Service had further restoration on the lighthouse completed in 1989. Fifteen-year-old Thomas Croteau of Peabody, Massachusetts, made the refurbishing of Derby Wharf Lighthouse his Eagle Scout Project for the Boy Scouts of America in May 2009. "The lighthouse has to be refurbished because the paint is chipped off all over the lighthouse... Also pointing has to be done which is filling in the spaces between the bricks to hold them together," wrote Croteau. He added, "...The lighthouse is a landmark and cleaning it will make it look better and when tourists go to visit Salem they will see how great the lighthouse is." He also pointed out that the work would benefit the U.S. Lighthouse Society, which brings tour groups to the lighthouse on occasion. The refurbishing was aided by other Troop 59 scouts, National Park Service representatives, and friends and family of the scouts. The work left the lighthouse in beautiful condition. Left: The scouts at work in May 2009. Below, before and after the refurbishing. It's an easy and pleasant walk to the lighthouse at the end of Derby Wharf. The Friendship, a replica of an eighteenth century China trade vessel, is docked at Derby Wharf (right), and a replica of a War of 1812 privateer, the Fame, is at nearby Pickering Wharf.